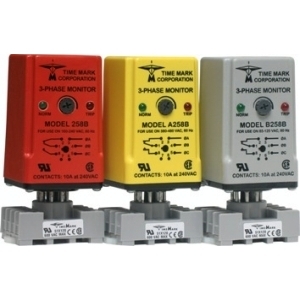 The Model 2652 3-Phase Monitor is designed to protect motors, pumps, HVAC equipment, air compressors, etc. , by sensing phase loss, low voltage or phase reversal. With correct power applied, the DPDT output contacts transfer, and drop out when a fault condition or loss of power occurs. An adjustable trip delay prevents nuisance tripping. The restart delay timer prevents short cycling, which is primarily used with HVAC and compressor motors. The DPDT output contacts allow the Model 2652 to be used in control circuits and alarm circuits. The automatic reset version can be converted to a manual reset, by adding a normally closed switch. 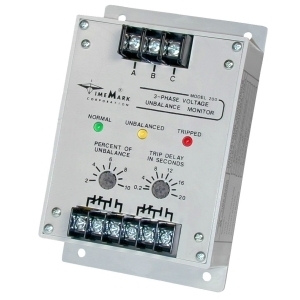 The different voltage versions of the Model 2652 can be adjusted over a wide operating range. This unit is housed in an ABS plastic surface-mount case to reduce space requirements. 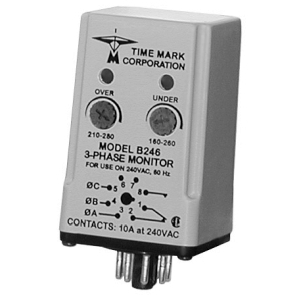 The Model 200 3-Phase Voltage Unbalance Monitor is designed to continuously monitor a three-phase line for unbalanced voltage conditions. This device will only energize the relay if an unbalance exists. Zero volts on all three phases is considered a balanced condition. This allows the Model 200 to be used with shunt breakers, so that the breaker can shut off the main power without tripping the monitor. The solid-state sensing circuit drives an internal electromechanical relay. Indicator lights on the monitor show when the voltage balance is within an acceptable range; when an unbalance exists; and when the relay is actually tripped. 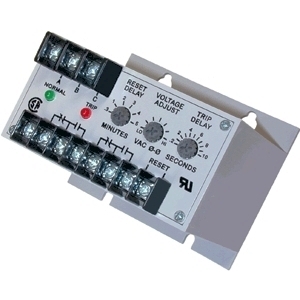 When an acceptable voltage balance is reapplied, the Model 200 will automatically reset the relay. 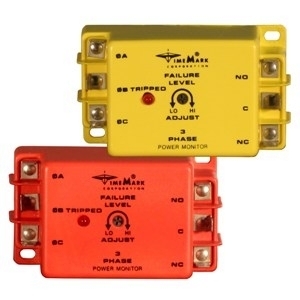 The Model 246 3-Phase Monitor is designed to continuously monitor 3-phase power lines for abnormal conditions. This device features solid-state voltage and phase angle sensing circuits, which drive a SPDT electromechanical relay. A neutral is not required, allowing the Model 246 to be used with either Wye or Delta systems. Three versions of the Model 246 cover the 120 and 208/240 VAC, 60Hz and the 380 VAC, 50Hz ranges. In addition, the models A246 and B246 are now CSA Certified. Each option on the Model 246 monitor is adjustable throughout its operating range. The adjustment pots and LED indicators of OVER VOLTAGE and UNDER VOLTAGE are mounted on the front of the unit, for easy access. 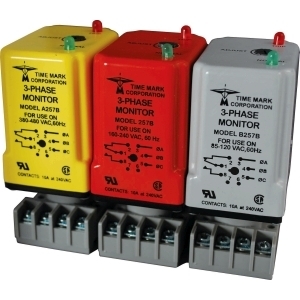 The Model 252 3-Phase Monitor continuously monitors 3-phase power lines for abnormal conditions. When properly adjusted, the Model 252 will detect phase loss on a loaded motor even when regenerated voltage is present. The device consists of a solid-state voltage and phase-angle sensing circuit, driving an electromechanical relay with one SPDT and one SPST contact. When correct voltage and phase rotation are applied, the internal relay will energize. A fault condition will de-energize the relay. When the fault is corrected the Model 252 will automatically reset. The Model 252 does not require a neutral connection and can be used with Wye or Delta systems. Four versions cover 120V, 208/240V and 480V, 60Hz, and 380V, 50Hz. Adjustment ranges are sufficiently wide to allow for proper adjustment to existing conditions. Two LED indicator are provided to aid in adjustment and system troubleshooting. 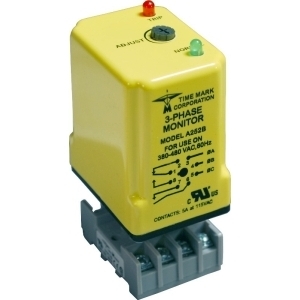 The Model 258 continuously monitors 3-phase power lines for abnormal conditions. When properly adjusted, the Model 258 monitor will detect phase loss on a loaded motor even when regenerated voltage is present. The Model 258 does not require a neutral connection and can be used with Wye or Delta systems. Voltage ranges are sufficiently wide to allow for proper adjustment to existing conditions. Both TRIP and NORM condition indicators are provided to aid in adjustment and system trouble-shooting.